Creating web content is a constant challenge these days. Indeed, for many online businesses the task of coming up with fresh web content on a regular basis is the block to their web success. In order to succeed in the search engine stakes, you need new, exciting, interesting and different content which you produce more frequently than your competition. If they add content every day, you need to do it twice a day if you are to be ranked higher. Similarly, if you are to get your online business mentioned in social media, to get people Tweeting about you, then you need to have something new or fresh. People don’t discuss old things, but chat about “the latest”. If your web business is to be part of the social world, you need fresh, new content to stimulate such conversations. Without new, vibrant content on your website you can’t really participate and benefit from the web’s two key arenas – search and social. Furthermore, you can’t fully indulge in email marketing because you have nothing new to tell the people on your list; they only want to get emails if you are telling them something they don’t already know. Producing new content is now essential to your online business survival. The problem for most businesses, however, is that they run out of ideas. They fill their website with “everything” they have to say and then cannot think of anything to write about. Bloggers face a similar situation – they start their blog full of enthusiasm and then after a few weeks run out of ideas; over 90% of all blogs that have ever been started currently lie dormant, untouched by their owners who simply cannot think of anything more to say. So, here are five straightforward steps which will help you in the process of creating web content – even if you have run out of ideas…! It doesn’t matter at this stage if you can’ think of anything to produce in terms of content, but having a timetable is essential. If you don’t have a written down schedule of when you will produce your web content, you will be unlikely to do it. Indeed, having a timetable is sometimes all that is needed to create web content..! But what kind of timetable do you need? The answer is to check on your competitors. If they are producing new content once a week, you need a timetable for twice a week. If your competition is updating daily, you need to update twice a day. In other words, do more than your competitors. Research shows that most website owners are updating their sites with new content once a week, on average. So, the chances are your timetable only needs to allow for two new pieces of content each week. Once you have decided on the frequency, work out which days and times are most suitable for you. Then allocate a specific one-hour slot in your diary for content production. Once it is in your diary, that time is no longer available for meetings or other activities, which means you have to produce some content. Find out what your target market really wants to know. Use keyword research programs, like Market Samurai or Advanced Web Ranking, to find out what people are really interested in. Conduct surveys using things like Survey Monkey to quiz your audience about the kinds of content they want from you. Also, try to go out and meet your website visitors; get to know them and analyse what they want in terms of content. You will find creating web content much easier if you really understand your audience requirements. Don’t neglect research in finding out what content you need to create. In amongst your research and your discussions with your visitors you will find some common themes. Now try to match these themes with the kind of marketing messages you want to provide. You should produce up to 10 different themes, allowing you enough different subjects to cover the average month of creating web content. Now allocate one of those themes to one of your timetable slots and then the next theme to the next timetable slot and so on. Now you know, for instance, that on the first Monday of the month you will be writing about your first theme. This provides you with some focus and prevents you from having “writer’s block” where you cannot think of what to write and sit there facing a blank screen…! You need something to help you generate ideas. So, organise yourself a method of collecting ideas. This could, for instance, be a notebook, a page in Evernote or a loose leaf folder where you throw in some notes. But have a central place where you collect anything which is related to any of your themes. If you want, you can have a separate notebook for each theme, or a separate folder, for instance. That way, when you come to the timetabled time slot for a particular theme you can go straight to your notes and see what ideas you have. Any time you have an idea, just make a note of it in the appropriate place – even if you are not scheduled to be creating web content on that subject for a few weeks. You can gain ideas by following relevant blogs, news sites and press release services in something like Google Reader, where you can combine feeds from these other sites into groups which are categorised according to your content themes. That way you will have a massive and readily available collection of stimulating ideas. One of the key problems facing people creating web content is staring at a blank screen, or going on some kind of web surfing expedition in the hope of finding some stimulation. But if you have organised your themes and you have your notes handy you are in a good position to produce something. But if you don’t start writing, nothing will happen. So, instead of seeking inspiration or trying to produce something which is perfect, just start writing something, anything, based on the theme which is appropriate to the particular time slot. It doesn’t matter if it is poorly written, it doesn’t matter if it doesn’t make much sense and it doesn’t matter if you think people won’t be interested. Just write something on your specific theme at the relevant timetable time. Once you have got something written, then you have the raw materials for turning it into a much better piece of content. One of the problems which many people have when creating web content is that they don’t actually start creating anything. They sit there, staring at a blank screen hoping for divine inspiration and then head off and do something else when they can’t actually think of anything. Simply writing something will get the process started. 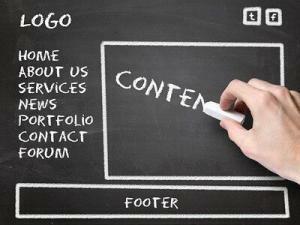 So, there you have five straightforward steps to help you in the process of creating web content. Get me to help you with your creating web content strategy – take a look at my web content strategy and planning service.